The gilet. The bodywarmer. The sleeveless jacket. Once the domain of incredibly practical outdoorsy folk who wore these shapeless, armless and often dowdy garments so they could ‘get on with stuff’. Nowadays, the bodywarmer-come-gilet scene has changed and definitely for the better. 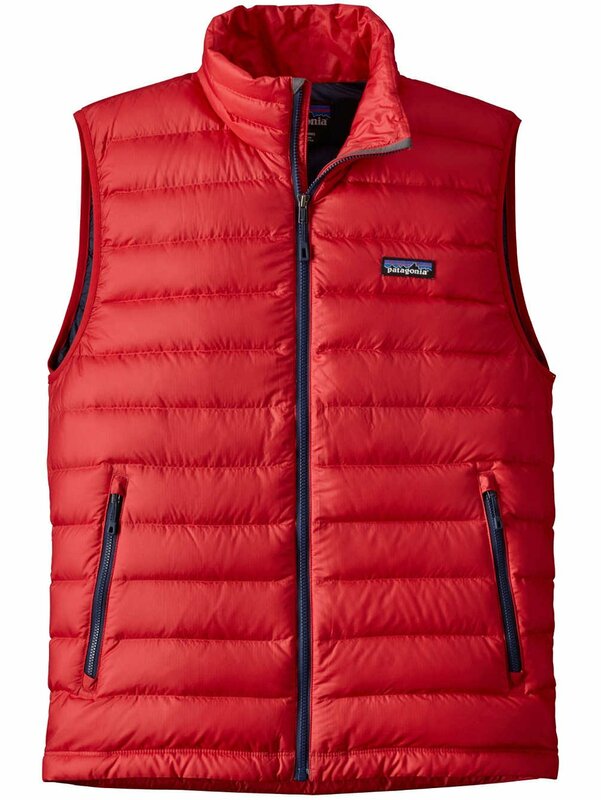 Top outdoor brand such as Patagonia, Rab, Arc’teryx, Berghaus and North Face (list not exhaustive) all have their own take on the increasingly popular gilet. And unsurprisingly they all have their own take on gilets by sporting activity too. In this review, we’re recommending winter gilets that essentially equip the outdoor enthusiast to deal with winter weather and still have the freedom of movement to do ‘stuff’. A decent bodywarmer is a staple on the kit list for most hikers, cyclists, runners, fishermen and golfers. But alas, not all gilets are created equal, more on this later. Above 65F, the body can easily maintain a core temperature ‘stasis’. However, a simple walk in the countryside, never mind the hills, in temperatures less than 65F and you’re going to get chilly. You simply have to keep your core warm – to clarify; your waist through your navel, through the torso and up to your neck/throat region. We’re taking for granted here that you’ll be moving around which naturally generates body heat (10/10 for the obvious statement) and if that all-important core is wrapped in a quality, insulating gilet, your freezing finger-tips, ear-tips and tippy-toes will be benefiting from the warm blood being pumped out to your extremities – it’s exactly what your central heating boiler is doing in your house, pumping warmth to your house extremities (in the form of copper piping and radiators!). Our lesson here – keep your core warm. The technology used to create the ‘modern gilet’ is phenomenal. We’re a long way down the icy road from a bog standard fleecy bodywarmer. Loft, fabric breathability, moisture wicking, windproofing and hydrophobic finishes are all features of the thoroughly modern gilet these days. As discussed, not all winter ‘bodywarming’ gilets are created equal, some are bulky and snug, others slim and windproof, some are super breathable when exercising and others just simply ‘look good with hood’. Let’s dive a little deeper into our 5 most recommended gilets which we’ll base on sporting pursuits with a Best of the Rest section to finish – do enjoy. This gilet is cosy, practical with 3 pockets and an adjustable hem to allow for freedom of movement if required and very ‘squishable’ into a day bag if the sun comes out. Even the mention of the word Scafell sends us reaching for a windproof jacket. This gilet is cosy, practical with 3 pockets and an adjustable hem to allow for freedom of movement if required and very ‘squishable’ into a day bag if the sun comes out. If it doesn’t, this gilet is crammed with Berghaus’ own product ‘Hydrodown’, which to the layman can translate as still warm when wet. Heard of boot waterproofing product Nikwax? Well, Berghaus has partnered with Nikwax and uses Nikwax to make their hydrophobic down incredibly water resistant. To achieve total dryness, wearing this Scafell gilet under a decent waterproof outer layer will equip you against the chilliest and wettest of December days in the UK. It’s a bulky number at 342g but you’ll be thankful when you’re summiting the bitterly cold Scafell Pike or any other wintery British fell for that matter. Does a great job of insulating the core without being puffy and bulky. To keep that core warm, the armholes have a lycra surrounding, keeping the warmth inside. There are 2 zips on the chest (car keys perhaps?) and 2 waist pockets presumably for sauntering down the high street as no one really runs with their hands in pockets now do they? Oh, and at 100g of padding it’s lightweight enough too. But what makes this gilet a winter hit for runners? Well, Vaude use Polartec Alpha synthetic insulation which means that “100 grammage” still does a great job of insulating the core without being puffy and bulky (the scourge of the serious runner). The caveat here, of course, is that if you’re sitting still the Alpha loft won’t be as effective, but this gilet recommendation is for active ‘movers’ for which the Vaude Bormio is highly recommended. 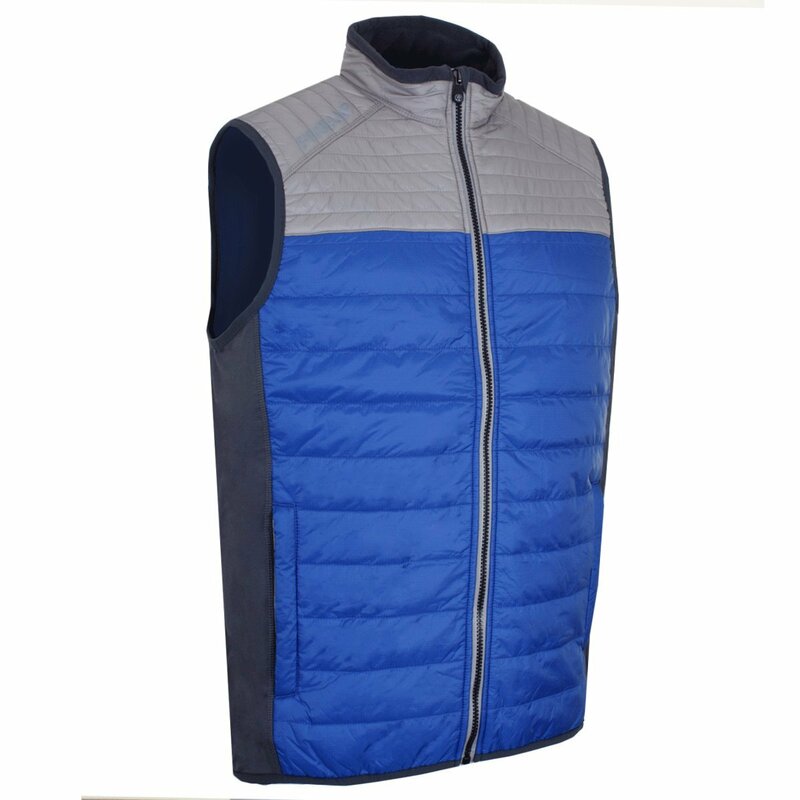 This golf gilet has quilted panels stuffed with Thinsulate lining with a full neck zip collar which is fleece lined. You may think any winter golf gilet may do but there’s a quality factor to consider, cheap imitations do not apply basically. They could leave you wet, cold and as we explained earlier, a cold core means cold extremities and in the incredibly frustrating game of golf, numb fingertips and losing the ‘feel’ of the club is a disaster, we’re talking bogey-ville or worse here. 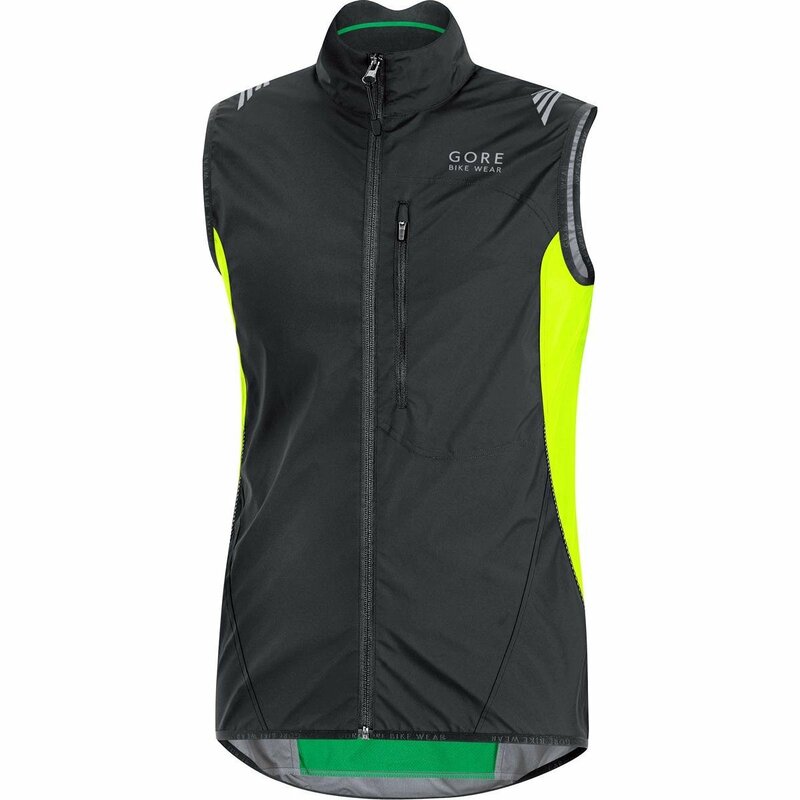 There are top brands that specialise in golf, including Galvin Green, Sunderland, Mizuno and even Nike but we’ve picked out this ProQuip gilet vest. ProQuip is a very reputable brand, manufacture their golfing apparel with quality in mind and help the aspiring year-round golfer equip themselves against the harshest of winter weather. This golf gilet has quilted panels stuffed with Thinsulate lining with a full neck zip collar which is fleece lined, ideal for when you’re looking down at that birdie putt without being distracted by an annoying collar. And, perhaps most importantly, the padding for warmth doesn’t interfere with the freedom of movement that’s so important if you’re a full swing driver or fairway master for that matter. ProQuip call it their power stretch fabric with good reason. This gilet does actually come in a full sleeve version too, but we’re reviewing gilets here so we’ll just leave with a link to the ProQuip full sleeve version instead. On the downside, the ProQuip Gilet may not stand up to torrential downpours like a golfing waterproof or an umbrella would, but you could certainly power through a shower. This gilet will keep your core warm, it’s machine washable, pockets front and back, highly visible and comes in a relaxed fit. When you’re hurtling down a hill, having just spent 30 mins of your life in the ‘red’ slogging up the ascent, you need to be enjoying your downward, freewheeling trajectory. And whilst the temperature is just above freezing with the windchill coming at you, cycling is a wintery discipline where you really do need ‘all the gear’. You pay for what you get. It’s surprising Gore hasn’t featured yet, given the breathability and WINDSTOPPER active shell trademark this brand can boast (perfect technology for many sporting disciplines actually). This gilet will keep your core warm, it’s machine washable, pockets front and back, highly visible and comes in a relaxed fit. It’s showerproof at best so you may wish to carry a pack away rain jacket too. The crux is this – don’t bother with the cheaper brands, this gilet is worth the money, it’s a Gore product. When you need a warm core, think Gore. It’s a little heavier than are other gilets at 281g – but it’s such a comfortable, well made, gilet, you need to be treating yourself. Patagonia know what they’re doing when it comes to all things puffa. We especially like the fact they do all the techy, warmth-giving, sporty looking design thing whilst being extremely socially and environmentally responsible. In fact, every goose down winter gilet vest Patagonia sells has full traceability of every single goose feather that’s used to construct the item. Marvellous. This particular Men’s Down Vest is made from 100% recycled polyester which they’ve managed to manufacture with water repellency (again, marvellous). It boasts an internal chest pocket for your hip flask, two decent sized waist pockets and elasticated armholes. You can also adapt the hem with pull cords affixed inside the main pockets. It’s a little heavier than are other gilets, so we’ve put it in the non-sporting category at 281g but it’s such a comfortable, well made, gilet, you need to be treating yourself for Christmas with this one. Buy it safe in the knowledge that you’re doing a bit for the environment too. If the weight and puffiness is a concern, would you Adam and Eve it, Patagonia do a Nano Puff too – it’s a little more ‘squishable’ into a daypack should things take a turn for the hotter.